Lions International chartered the Millersport Lions Club on June 4, 1946, under the sponsorship of the Hebron Lions Club. In the spring of 1946 a Hebron Lion past president, Edward Schmid, invited E.H. “Doc” Fahl to a meeting in Hebron with the idea of getting the latter to join the Hebron Lions Club. This led other Hebron Lions to suggest sponsoring a new club in Millersport. President Paul Sellars, Lawrence Holtsberry, the secretary, Gail and Brook Walters and the president-elect Henry Langham, were some of the Lions who thought it was a good idea. They thus prevailed upon Doc Fahl to get fellow businessmen to sign an application to become the Millersport Lions Club. Hebron Lion George Bormuth was called upon to work with Fahl while 27 other men were signed up within a few weeks. The charter (dated June 4th) was presented to Millersport on June 17 from Lions International. The first Charter Night was held on July 11, 1946. On this very hot night, the club started its calling in the K. of P. Hall under the district governor, Roy Calendine of Portsmouth. Due to many reasons including difficulty of getting someone to cook the dinners and constantly searching for a place to meet, our first year was a rough one, but perserverance won out. Hebron Lion Ed Schmid was named the “daddy” of the Millersport Club for it was he who stuck by us in all our rough times in the early years, together with the help of Lions Holtsberry, the Walters, A.M.Brown, and the entire Hebron Club who served their offspring like an old mother hen. 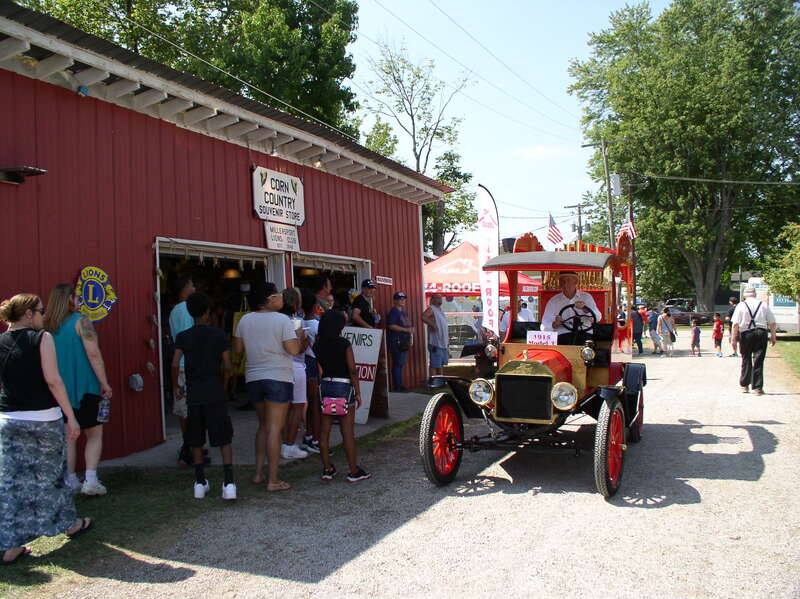 The Hebron and Buckeye Lake Lions assisted in starting our first fundraising project in 1947, which today is widely known as the annual Millersport Lions’ Sweet Corn Festival. From the cooking of sweet corn in one butchering kettle, then two, the consumption of fresh sweet corn has grown to the point that we need to truck the fresh sweet corn in by the semi-trailer loads and boil the corn in 2,000 gallon propane heated vats during this 4-day event. The Sweet Corn Festival is the major fund raising event of the Millersport Lions. The Lions support many projects, but our focus is toward reducing blindness and the curing of diseases that cause blindness. Many groups that include churches, fire departments, youth groups, scouts, schools, lodges, and in fact practically all community organizations share in the benefits from our event. The current group of over 80 non-profit charitable organizations currently represents people from an eight county area in central Ohio. There are no private concessions permitted in our festival insuring that all profits derived from the festival are turned back into the various communities as civic improvements in one form or another. E.H. “Doc” Fahl became the first club president and the secretarial work was done by Doc as the office was the kitchen of his drug store for the first three years. John W. Thomas, our second president, took over all emcee work for both the club and the festival in the early years. Maurice M. Thompson, our third president, was mayor of the village at the time of our first festival and contributed immensely to its start, on the street at the intersection of Lancaster Street and Chautauqua Boulevard across from Doc’s drug store. There were many Lions and citizens of Millersport that donated items, time, and labor from the beginning to make the festival what it is today. The festival has something for the whole family featuring freshly prepared hot butter flavored sweet corn served fresh on the cob along with a wide variety of food, four entertainment stages, large midway, parade, queen’s pageant, dancing, contests, and a variety of live music set in an authentic small town festival atmosphere in a shaded hickory grove park. The four-day festival is a major source of income for approximately 80 non-profit charitable organizations that operate all of the food & game concessions, whose profits go toward their administration and community projects. Held annually Wednesday through Saturday before Labor Day. In 1954 the Lions purchased five plots of land on the east edge of Millersport on Chautauqua Boulevard about 1/2 mile east of the original location. These five lots have been developed and added onto to become Historic Lions Park that is the current site of this festival. In 1996, during the 50th year of the Sweet Corn Festival, these five lots were named Founders’ Commons and this space was dedicated to the 28 charter (original ) Lion Members of our Club. In 1967, the Lions built the Clubhouse. A major addition was added in 1994-1995 thanks to the financial contributions the Estate of Joanna Powers, the Monticello Rebekah Lodge and the Millersport Lioness Club. This facility is used for many private and community activities as well as serves as Millersport’s Senior Citizens Center. In 1971 the Millersport Lions sold ground to the village of Millersport for $1000 for the space to build the community pool. In 1974 the Lions sold land to the Walnut Township Local Schools for the purpose of building the new Millersport High School, school bus compund, and also the football, baseball and track complex. Today’s Historic Lions Park encompasses land that was originally the Robert Mast Farm, the Paul Thomas Farm, the Marcus Hanna Farm, and the James Dupler Farm. During 1981, the Millersport Lions acquired the ownership of the 1864 Charles Holliday Covered Bridge and moved it the six miles from over Walnut Creek on Lake Road to the festival grounds in February of 1982. In June 1997, the Lions moved the 1930 Slater Gas Station four miles from just north of the intersection of State Route 37 and State Route 79 to our developing “Heritage Village”. We moved from Thurston to Historic Lions Park the original Walnut Township House in March 1998. February 1999 saw the addition of the 1800’s Spurgeon Ino Store moved from downtown Millersport to Heritage Village. The Heritage Committee received the donation of an 1800’s Ohio Canal Freight Barge that was moved from Towpath Island on Buckeye Lake to the festival grounds in April 1999, but was destroyed by high winds in 2008. The Watson Oil Company Building was moved to Heritage Village in April 2001. In the summer of 2002, the Brison Farm’s 1887 Summer House was moved to the park from the family homestead on State Route 204. In 2004 the town’s old post office was relocated to the park because the Watson Oil Company was expanding their service station. These historic structures have been moved to Historic Lions Park so that all of our visitors and neighbors may experience these local treasures. The spring of 2010 kicked off one of the largest capital improvements projects ever at Historic Lions Park with demolition of the Safety/Security Office, Central Festival Office and the Lost Children’s Center to increase the lawn seating area of the Entertainment Pavilion. A 40’x60’ new building was constructed in the Midway in an effort to consolidate all festival administrative, security, and cash control operations in one centralized year-round facility with flexibility to host club and festival meetings. In the fall of 2011 members loaded up the antique 1948 General Machinery Corn Husker and transported it to Star Engineering in New Lexington for a complete restoration of this historic marvel. Lion Steve Shover had arranged for Star Engineering to do a rebuild and replacement of parts as a corporate donation. The “big green machine” returned in July of 2012 after members had built a new foundation for it the rest upon. This was the only time it has left Historic Lions Park since it was purchased in 1958. For our 70th anniversary in 2016, our midway went through a major expansion by expanding the area by 100 feet, adding a new roadway and lighting to accommodate bigger and more amusement rides. A section of the Major Prize Building was fitted with a mural depicting an Ohio cornfield where we placed the “Corn Throne,” a large metal sculpture donated by the Millersport High School Art students and local artist Ric Leichliter, for patron to take photographs and post on social media images of their visit to the Sweet Corn Festival. Durant Amusements brought the Franzen Performing Animals, a traveling circus, as a special attraction for the 70th celebration. The Millersport Lions have sponsored the Etna Lions, Rushville Union Lions, Millersport Lioness, and the Millersport Leo Clubs. Over the years, the Lions have remained active in the Millersport community and are financially supportive of our community, state, national, and international Lions projects.